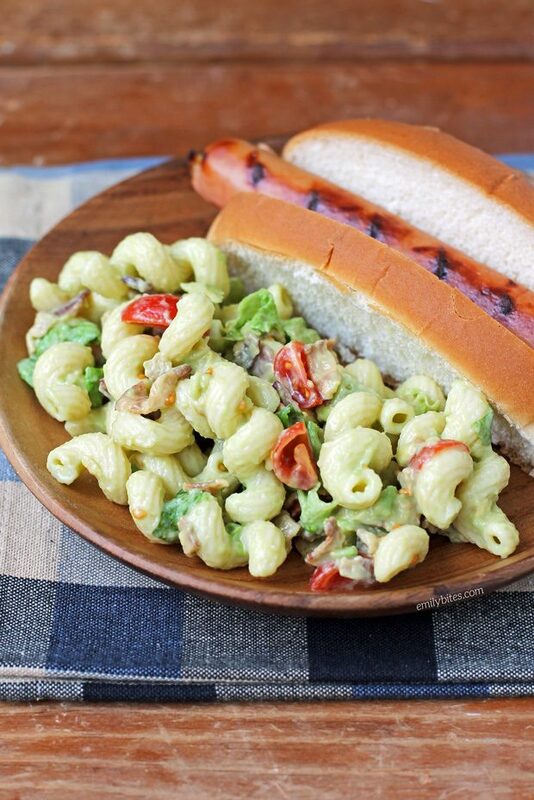 Summer is salad season, and this Avocado BLT Pasta Salad is the perfect crowd-pleaser to bring to any picnic or barbecue or to make for yourself at home! 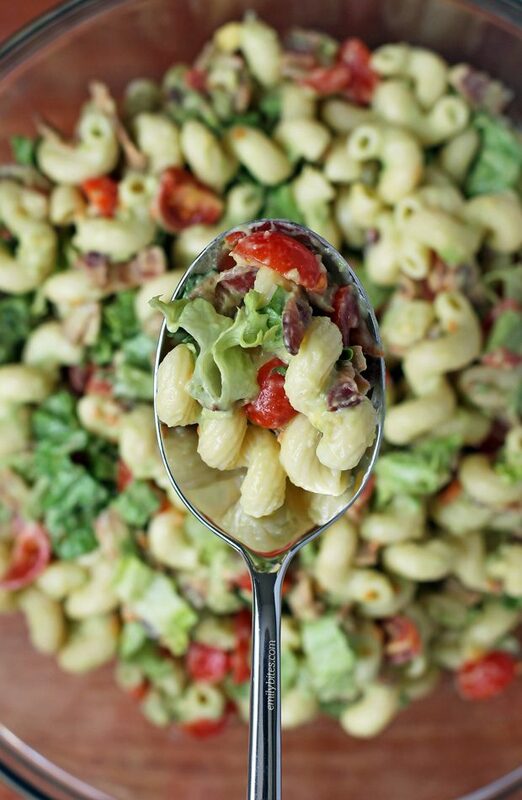 Hearty pasta, crispy bacon, juicy tomatoes and fresh lettuce all tossed in a creamy avocado dressing – it’s so many of my favorite things in one dish! This pasta salad is great as a side dish or for lunch and a one cup serving is only 175 calories or 5 Weight Watchers SmartPoints! I particularly love pairing it with chicken or steak off the grill. 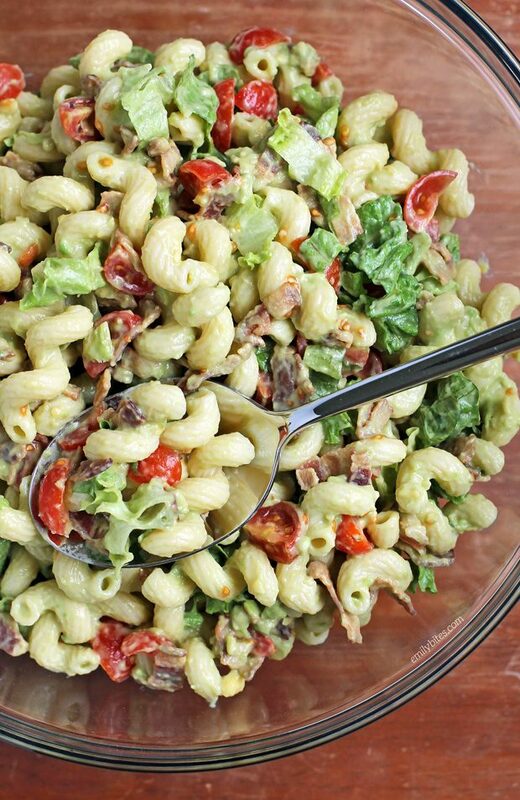 This Avocado BLT Pasta Salad is super easy and comes together quickly, but you can even make the pasta ahead of time if you want it to go faster. After cooking, rinse the pasta to cool before storing and when you’re ready to use it just rinse and drain it again before adding the other ingredients. So simple! Looking for more tasty lightened up salads? Check out my Pepperoni Pizza Salad, Strawberry Quinoa Salad, Asian Sesame Chicken Salad, Broccoli Salad, Roasted Beet Salad, Honey Mint Citrus Salad, Taco Chicken Salad, Avocado Bacon Corn Panzanella Salad, Antipasto Salad, Butternut Squash Quinoa Salad, Greek Orzo Pasta Salad, Harvest Apple Salad, Hummus Chicken Salad, Doritos Taco Salad, Buffalo Chicken Pasta Salad, Cheeseburger Salad, Avocado Chicken Salad, Chicken Souvlaki Salad and more in the Salad section of my recipe index! This looks super yummy! My only question is since I’m not a big avocado fan, how many calories is a serving without it? The avocado is what makes the bulk of the dressing in this recipe so you would have to replace it with something else like more mayo. I only calculate the nutrition info for the recipe the way I post it so if you want to make changes to my recipe you can always run the ingredients you use through the recipe calculator on myfitnesspal. Hope that helps! Since there is avocado in this recipe – how long will this last before the pasta salad turns brown? Just made this, absolutely delicious! I exchanged one package of Hormel Applewood Bacon Pieces for the 8 bacon slices.